Have you not noticed how often they became silent when you approached them, and how their strength left them like smoke from a dying fire? My apologies in advance for what you are about to read. As my longtime readers can attest, this is an atypical posting for me, but one that I feel is necessary after many repeated provocations by a certain individual and his cronies, whom I have collectively and affectionately dubbed as the "CoD" (Confederacy of Dunces). This will be my one and only statement on the matter, so I thank you to please indulge and humour me just this once. A blowhard and a freeloading mama's boy has publicly insinuated that I fraudulently claimed to have created the unique combination of my Mastic Shrimp Saganaki recipe. As I do not normally engage in mean-spirited and petty arguments, I will allow you, my readers to form your own conclusion as to the veracity of my/his claim. 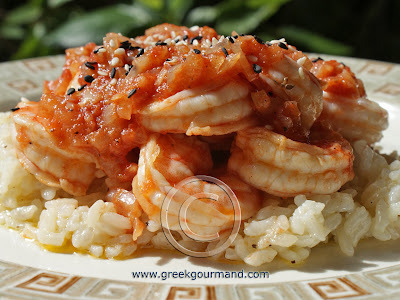 To sweeten things up somewhat, I am offering a bounty of $100 to anyone who can find a recipe for Mastic shrimp in a tomato sauce, similar to or exactly like my own, that was verifiably published before mine (in Greek or in English). It saddens me to have to waste precious life moments on the fatuous charge made by a scoundrel, but the Internet is full of people who say whatever they like, and who think they can get away without ever being called to account. Now, IF (and that’s a big IF) I unwittingly represented the combination of shrimp, mastic, and tomato sauce as my own creation when it was not, then I will be happy to recant my claim and pay out the $100 to anyone who can prove such is the case. 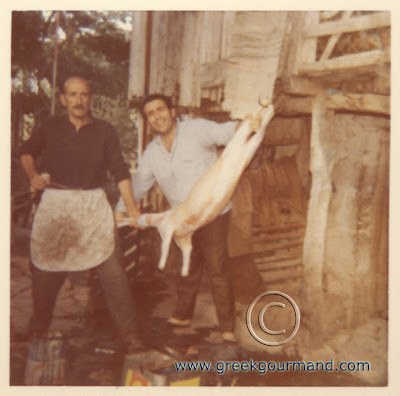 Now, who said Greek food wasn’t interesting? 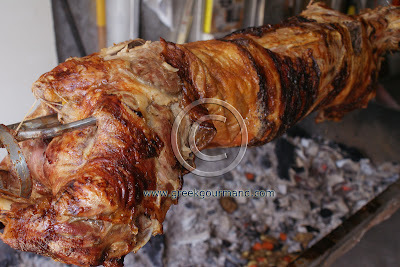 This is one of my Greek food signature dishes. I created this recipe for my wife and it is now her favourite shrimp dish. For those of you who are unfamiliar with mastic resin, have a look at my previous post about this extraordinary spice. Here in North America, the term saganaki often refers to a Greek fried cheese that is set alight to resounding shouts of “Opa!” In truth, the word saganaki refers to a single-serving frying pan with two handles. In Greece, a saganaki can be a fried cheese, or it can be a shrimp saganaki and/or a mussels saganaki, both of which are usually tomato sauce based dishes and typically include Feta cheese. If this is confusing, no worries, it’s all Greek food to me too! This particular version of my dish does not include the Feta cheese as it is meant to be a fast-friendly recipe. 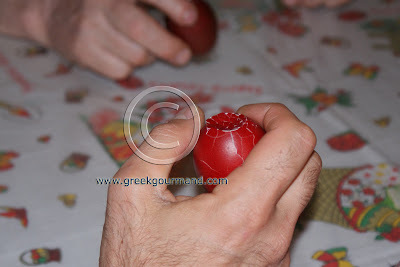 Easter is just around the corner and many Greeks observe the Lenten fast during this period which means dairy is a no-no. If you are not fasting, feel free to add the Feta cheese as mentioned below. You can also halve the quantities of ingredients as listed for a single serving portion. 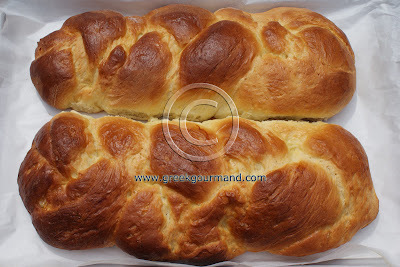 In addition, if you happen to have some good olive bread on hand, it makes for an excellent complement which allows you to mop up every last bit of this unbelievably tasty sauce. Sauté diced onions in olive oil over a medium heat until soft and translucent (3 - 5 minutes). Add garlic to the pan and stir it in well for about 30 seconds. Then, add the tomato puree/sauce to the pan, along with the diced roasted red pepper and a half cup of water, then the salt and pepper to taste and stir it well to mix. Bring to a boil. Reduce the heat only slightly and allow the sauce to simmer well for 8 minutes; do not cover the pan. Add the masticha liqueur along with the ground mastic resin to the sauce and stir well to incorporate. Continue to simmer the sauce for another 2 minutes, stirring the sauce a couple more times. 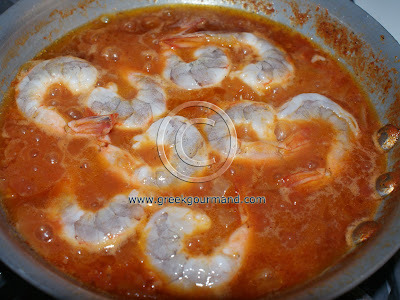 Quickly add the shrimp to the pan and make sure to give the pan a couple shakes to settle the shrimp well into the sauce. Cook for two minutes. Then, using a pair of tongs or a fork, quickly turn all the shrimp over and cook for another minute or so, then remove the pan from the heat for serving. I often serve this recipe over a bed of rice and garnished with some sesame seeds. as depicted in the photo above. It is equally good with pasta, especially spaghetti or linguini noodles. 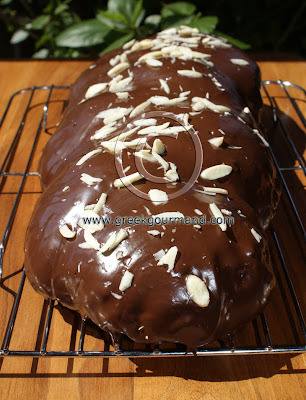 Or, you can simply eat it on its own with some olive bread as already mentioned. Also, if you are not able to find the mastic liqueur, simply add another teaspoon of the mastic resin to the sauce when cooking. Lastly, a cup of crumbled Feta cheese can optionally be added to the pan just before you remove it from the heat for serving. 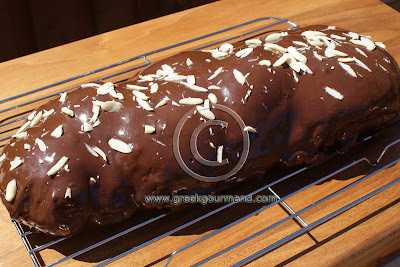 From time to time, I like to mix a reflection or two in among my Greek food recipes. Today’s topic is one that really tickles my fancy. As far as spices go, there is surely none more unique or rarer than the mastic resin from the Greek island of Chios, reputed birthplace of the poet Homer. Pure mastic resin "tears" - Click to Enlarge Image. 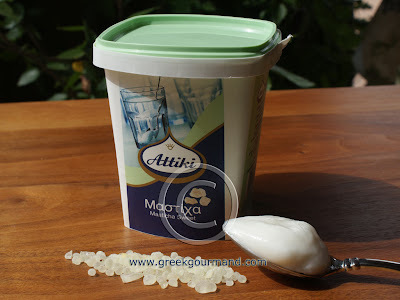 Mastic (or ‘masticha’ as we say in Greek, pronounced “mahs-TEE-ha”) is a resin produced by an evergreen shrub, Pistacia lentiscus, which is related to the pistachio tree. The word 'mastic' is derived from the ancient Greek verb ‘mastikhein’ which means “to chew”. The English word “masticate” (to chew) is derived from this root as well. When any company of women meet in Turkey, some Mastick is brought them on a server, and each taking a little, they are chewing and spitting most of the time. It is comical to see the old women roale it about their gumms; the effect which they find by it are that it carries away the flegme, cleanses and prevents the aking of the teeth; and causes a sweet breath. Mastic resin is the original chewing gum. Recently, I watched an episode of The Hour, with host George Stroumboulopoulos, in which it was stated that chewing gum was invented in Mexico. Nothing could be further from the truth. The earliest mention of mastic resin used for chewing is found in a fragment of an ancient Greek Comedy dating back to the 5th Century B.C. The ancient Greeks chewed mastic for fresh breath and to clean their teeth, a practice that was picked up by the Romans and Byzantine Greeks, along with later medieval Europeans including the Venetians, Genoese, and the Ottoman Turks in their turn. Mastic was also reputed to have a salutary effect on gum disease, stomach distempers and other gastrointestinal ailments, and was thus considered a medicine by ancient medical practitioners; evidence for this can be found in the writings of Hippocrates, Dioscorides and Galen. Thus, it is hardly surprising that the island of Chios was a much sought after commercial prize by occupiers from both East and West. After the Romans came the Byzantines, after them the Venetians, then the Genoese, and after them came the Ottoman Turks; and finally, a return to full Greek control again in 1923. Yet, the importance of the mastic harvest was such that, even under Ottoman rule, the Mastic-Villages were allowed a form of self-government under their own parliament. Today, mastic cultivation, harvest and production continue on the island of Chios pretty much unchanged in practice and tools since antiquity. Some 2 million mastic trees are cultivated and harvested by members of the Mastic Producer’s Association of Chios, which is comprised of some 5,000 persons from the 24 Mastichochoria. The manner in which mastic is harvested is as unique as the resin itself. The “kendos” (mastic harvest) begins in June and continues through to September. It is a very labour intensive process and is done completely by hand. The ground beneath each mastic tree is scrupulously cleared and a layer of fine white clay sand is spread about the base of the shrubs. A series of arch-shaped incisions are made in the trunk and larger branches of the trees with a special tool known as a “kentitiri”. The mastic resin seeps forth from these incisions and coagulates into crystallized resin “tears” which drop (or are scraped) onto the surface of the white sand below. It is then harvested via a sifting process, cleaned, and selected according to grades. The grades of mastic resin quality are based on levels of purity and are divided into 5 grades. The highest quality mastic is the purest form of the resin and is considered Quality 1, whereas Qualities 3 – 5 can contain small pieces of the tree’s bark, leaves, or other detritus. The ancient Greeks also produced a mastic oil, and the mastic resin was further used to flavour wines, a practice which survives today in the form of Mastikha spirit. Here in Ontario, a mastic liqueur is available in select L.C.B.O. 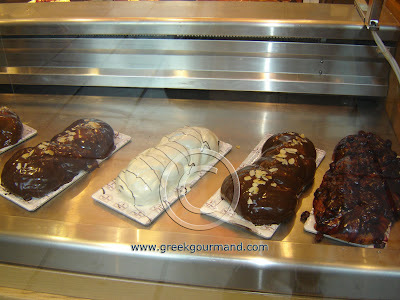 stores under the brand name Skinos and it is imported by the Kolonaki Group Inc. 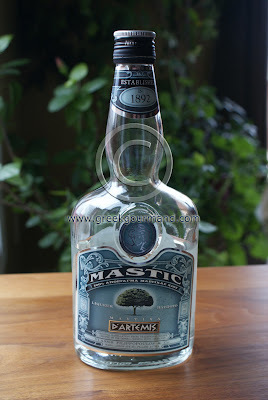 The traditional mastic based spirit is known on Chios as Mastikhato, though it is usually referred to simply as Mastikha. Today, mastic resin is widely used in culinary, medicinal, cosmetic and pharmaceutical applications the world over. Modern researchers have found that mastic resin aids in the healing of peptic ulcers by killing Helicobacter pylori which can also cause gastritis and duodenitis. Furthermore, mastic oil contains perillyl alcohol, which has been found to be effective in both the prevention and treatment of some forms of cancer as it arrests tumor cell development. Mastic resin also effectively absorbs cholesterol thereby diminishing the chances of heart attacks and lowering high blood pressure. 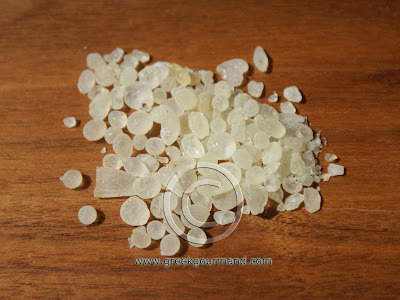 In Greece, mastic resin can be found in numerous commercial and homemade products. It is used as flavouring for liquors, chewing gum, pastries and spoon sweets (along with other desserts), ice creams, in breads and in stews; it can also be found in toothpastes, cosmetics, lotions for skin and hair, soap, and perfumes. Mastic is also used in several Turkish recipes and preparations and remains quite a popular spice in neighbouring Turkey as well. Finally, one of the most interesting historical associations relating to mastic and its production has to do with Christopher Columbus. The unique nature of mastic resin was one of Columbus’ reasons for undertaking his voyage of discovery. In his First Letter to Isabella I of Castile, Columbus enumerates the possibility of finding a new source of the mastic resin in the West as one of the reasons he believed his undertaking was something worthy of the Queen’s funding. Curiously, Columbus uses the Greek spelling of the name of the island i.e. Xios, where the unique resin was cultivated. This, along with a number of other interesting points has led some to conclude that Columbus was actually a Greek from Chios. Was Columbus of Greek origin? I don’t know. There are definitely some pretty curious facts among what little we actually do know regarding the man and his origins, but I have not come to any conclusions. If you want to read more on it, try Matt Barret’s brief discussion of the matter. 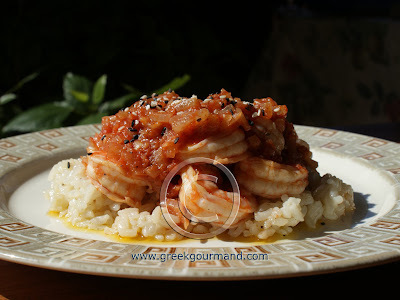 Try my Mastic Shrimp Saganaki recipe to enjoy the unique flavour of cooking with mastic gum. 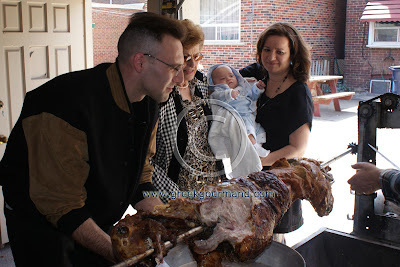 My Big Fat Greek Food Blog Contest Winner! Thanks to everyone who submitted an entry along with their kind words of encouragement. :-) I was pleasantly surprised, and a little overwhelmed, by the number of entries received. I was glad to read that all of the entrants enjoyed the scavenger hunt format of the contest; I will retain it for future giveaways. Now to the matter at hand. 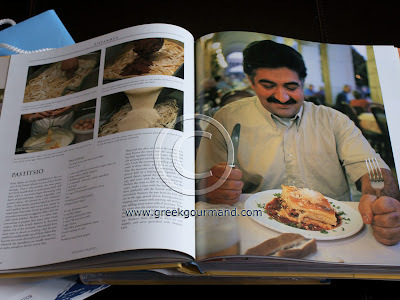 The winner of a copy of the book "Culinaria Greece" by Marianthi Milona is fellow culinary enthusiast and food blogger Donald Orphanidys a.k.a. Mr. Orph. Donald correctly answered the 7 questions in the contest quiz, and his name was chosen by a process of random number generation from among all the correct entries. Congratulations to Donald! I will be shipping him the book on Monday. For those of you who did enter the contest but did not win this time round, there's a few more copies of the book to be given away yet. 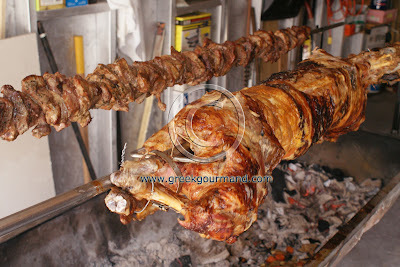 Stay tuned for more great Greek food related contests on the way, my friends. Who knows, you may be the next winner. But you can't win if you don't play!